The Patriots seemed to have this one easily in control on Thursday night before Jameis Winston almost pulled off a huge come-from-behind win. The game itself was typical of Thursday night affairs. Neither team was especially sharp with each missing the opportunity for big plays and penalties (especially on the Patriots side) being numerous. The best news you look for on Thursdays is to come out with a win (they did) and to come out of the game as healthy as you can. And yes, the Patriots seem to have come out of this relatively unscathed. His best drive, not coincidentally was the Patriots only touchdown drive of the night where he was a perfect 7-7 for 84 yards with a nice throw to Chris Hogan just over the line and into the end zone. His best throw of the night was a deep one to Brandin Cooks where Brady performed the “bucket drill” to perfection, dropping the ball perfectly in his hands for a big gain. He made another just like that to James White who ran a wheel route and was open down the right sideline. His worst throw happened to come on the Pats opening drive where he was late and way behind Hogan and got picked off for his first interception of the season. Perhaps we’re being a bit harder on the grades here, after all, Brady completed about 75 percent of his throws for 300 yards in the win while missing his top two receivers, one of which was a game-time decision. The backs were good on Thursday night. We pointed out in our pre-game matchups that the team could boost Dion Lewis’ reps and perhaps give the running game a shot in the arm and that is exactly what they did. Lewis looked really sharp and he showed his elusiveness on several runs. He had a nice 31-yard scamper where he used his eel-like ability to evade tacklers and break into the secondary. Mike Gillislee likewise had a good night running the ball and had 52 tough yards on 12 carries. White had another stellar night out of the backfield catching the ball and keeping the sticks moving. James Develin was solid as a blocker all night but ran a wrong route and nearly cost Brady an interception. The wide receivers took advantage of what they were given and did exactly what they needed to do. The Bucs were laying back in a two-safety deep zone to take away the deep passing game so Brady and the wide receivers worked the short and intermediate game work and were very effective. Danny Amendola was targeted eight times and had eight catches for 77 yards. He had some really nice conversions on third down where he did exactly what he needed to do to move the chains.His best catch was reversed on a push off but he made a highlight reel one-handed catch. Hogan had a solid night with eight catches for 74 yards and the team’s only touchdown. He was also wide open going down the left sideline late in the game but Brady got hit and the throw sailed out of bounds. Cooks had five catches for 85 yards including the nice bucket drill catch as well as a sweet 18-yard comeback route where he was given a ridiculous cushion in a testament to the respect the Bucs have (they played him twice a year in NO) for his speed. Rob Gronkowski was a late scratch and the production from the tight end position in the passing game was zero. Jacob Hollister was targeted once and later drew a holding penalty. He also got chewed out by Brady for a missed route in the end zone. Dwayne Allen is still searching for that elusive first catch as a Patriot. His blocking was subpar on Thursday, he got taken to school by Noah Spence where Brady was sacked. The Patriots will need much better production from these guys down the road, especially if Gronkowski misses any further time. The offensive line did a better job in the running game as the team was able to put together a decent night running the ball but for a team that entered the game with one sack and who was having trouble getting pressure on the QB, the Bucs certainly didn’t appear like that team. Most of the pressure was coming from the left side where Nate Solder has been playing hurt and several times he showed that he can’t step out to the edge fast enough to contain the edge rusher. But it was coming from everywhere. This unit has allowed Brady to be sacked 16 times in five games after allowing just 15 in 12 games a year ago. That isn’t good. Taking a look at the upcoming schedule, it is an issue that needs to get fixed pretty quickly. The Patriots defensive line did a better job on gap control in the running game other than the Bucs first touchdown drive. Doug Martin who finished with 74 yards, had 49 on that one The rest of the game he had eight carries for 25 yards. While not great, it was better than they had done the previous two weeks. The pass rush was pretty inconsistent again although Winston is a tough guy to bring down. Deatrich Wise and Cassius Marsh took back to back roughing the passer calls at the end of the first half to give the Bucs a chance at a long field goal and that sequence can’t be happening. But Marsh shows a pretty good burst off the line. Dont’a Hightower moved back to the inside on running downs and only lined up on the edge in what seems like obvious passing downs. And guess what? No breakdowns, no communication issues and overall much better play. He filled the correct holes where he needed to and the defense was looking much better because of it. Elandon Roberts made a nice run stuff on third down and nearly got a safety on Winston, blitzing up the A-gap (where has that been?). Probably should have been called an intentional grounding call there, but maybe we’re being picky. Van Noy had an up and down night, getting beat in coverage but got a half-sack. Much better. Much, much better by this group. Why? Because for three quarters Malcolm Butler and Stephon Gilmore were given very simple tasks. Stick with a wide receiver no matter where he goes. Gilmore locked up with Mike Evans and for the majority of the night put him on a milk carton. Butler had the speedy Desean Jackson and likewise did a good job. Thru three-quarters Winston had 110 yards passing. In the fourth, Matt Patricia went back to more zone and Winston and the Bucs were finding seams to exploit. Devin McCourty and Pat Chung had good days in coverage, for Chung it was his best game of the season. He had the good receiving tight end Cameron Brate and provided solid coverage all night long. No breakdowns or blown coverages…so it was a good night overall. A long way to go but a positive first step. Stephen Gostkowski made four field goals and was money on those and his kickoffs. Danny Amendola had a really nice 40-yard punt return that set the team up in great field position. Kickoff coverage was good. Punt return coverage was good. Ryan Allen was okay but not great. But what killed them was penalties. Four ST penalties aren’t going to cut it. Brandon Bolden jumping offside on a 4th and 3 is inexcusable for a veteran such as himself. Bill Belichick righted the ship in a short week with just really two days to prepare after a debacle on Sunday. The best moves were putting Butler and Gilmore on the Bucs top WRs and let them do what they do best, provide close man coverage. And moving Hightower back inside. The defense looked completely different on Thursday so there is the hope that this is a trend in the right direction. Josh McDaniels had to switch the game plan without Rob Gronkowski to a more 3-4 WR set and although the team struggled to finish drives, they moved the ball well all night. This was a gut-check type of game and the team won. That’s all you want from Thursday night. This entry was posted in 2017 Patriots Season, Patriots Commentary, Patriots News and tagged 2017 Patriots Season, Bill Belichick, Chris Hogan, Danny Amendola, Dion Lewis, Doug Martin, Jameis Winston, James White, Malcolm Butler, New England Patriots, NFL, Patriots, Rob Gronkowski, Stephon Gilmore, Tampa Bay Bucs, Tom Brady, Trey Flowers on October 9, 2017 by Steve Balestrieri. In the end, the best thing to say about this game is the Patriots came away with a win…barely but it was a win and now they have 10 days to prepare for the Jets. The game on Thursday night was a prototypical Thursday Night Football contest, ugly, ill-disciplined, sloppy played affair, punctuated with those hideous uniforms the NFL insists making the players wear. But perhaps it is a good move, for the players and the game scarcely resemble an NFL product at times during these Thursday contests. In the end, the Patriots escaped Tampa with a 19-14 victory and are back in the win column. But this one won’t be highlighted as one of those quintessential New England wins since they seemed for much of the game to be trying to keep the Bucs around long enough to give it away at the end, which they almost did. Stephen Gostkowski was a perfect 4-4 on his field goal attempts while Nick Folk of the Bucs?…. Not so much. Secondary Played Much Better: In the end, Jameis Winston threw for another 300 yard game against the defense, so there remains much work to be done. But thru three-quarters Winston had just 110 yards passing and the unit scarcely resembled the one who couldn’t get out of its own way for the first month of the season. The coaches did what they needed to do and put Don’ta Hightower back in the middle for much of the game, and allowed cornerbacks Malcolm Butler and Stephon Gilmore to do what they do best, play man coverage on Tampa’s two top WRs Mike Evans and DeSean Jackson. The results were much better. They both competed hard and Gilmore had his best day in a Patriots uniform holding Evans, who was a non-factor for the vast majority of the game to just five catches for 49 yards. Baby steps….to be sure but a positive one for the defense. Brady was Sharp But Missed Gronkowski: Tom Brady was his usual very efficient self, completing 30-40 for 303 yards with one TD and one interception, his first of the season. 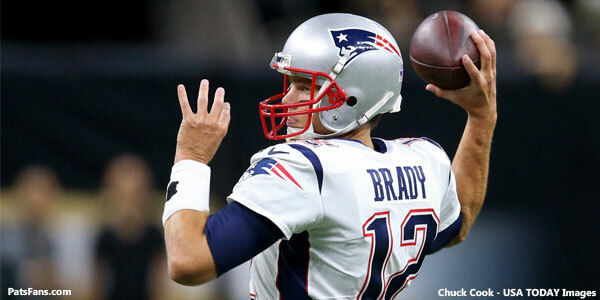 Brady was especially sharp in the second quarter where he constantly moved up and down the field and completed all 10 of his throws and added a touchdown. With Tampa’s defense missing some key personnel in the middle of the field, Brady and Josh McDaniels consisted isolated mismatches on the linebackers and made the Bucs pay. But once they got close, the offense couldn’t finish and ended up with just a single touchdown on the day. It was here that the offense, already without Julian Edelman for the year, missed Rob Gronkowski as they moved easily into scoring range and then seemed to be operating in the mud. Having no production from the tight ends was an issue that kept Tampa in the game. Brady could be seen taking rookie tight end Jacob Hollister to task after a red zone stall. Obviously, there was a disconnect there that needed to be worked out. Offensive Line Woes Continue: Brady was hit hard several more times and was obviously in a lot of discomfort after several plays tonight. Tampa scarcely resembled the team that couldn’t generate any pass rush and had just one sack entering the game. They had three on the night and frequently flushed Brady from the pocket or knocked him down. After being sacked just 15 times in 2016, he’s already been sacked 16 times in five games. This is a trend that needs to stop. Brady will use this 10-day break for some much-needed rest and recuperation. He’s taken far too many big shots this season and despite his fourth straight 300-yard game, he’s under duress far too often. Avocado ice cream on the menu for this weekend. The OL did do a better job at times in the running game. The team rushed for 113 yards against a team that had been allowing just 72.5 yards per game. Again it wasn’t great but it can be used as a building block to build upon down the road. Dion Lewis Steps Up: In a short week, the team will have to rely on different players to pitch in and take on expanded roles. One of those players was Dion Lewis, who has been conspicuously absent in much of the offense’s game planning through the first four games. But as we pointed out in our pre-game key matchups earlier today, Lewis could give the offense a boost in the running game and did just that. Lewis saw the most action he’s seen this season and had a very solid game running the ball. He looked a lot like the 2015 version of himself, at times giving an eel-like ability to slip tackles and get yards after contact. He rushed seven times for 53 yards and added two receptions in the passing game. Coupled with Mike Gillislee’s 12-carry, 52-yard night, the two gave the Patriots a nice building block in the running game. Was it perfect? Nope, but it does add some intriguing possibilities down the road as the team will try to find that better balance between the passing and running games. Who Are You Guys And What Did You Do with the Patriots: Once again, the Patriots were guilty of some extremely stupid gaffes resulting in penalties that cost the team. One of the hallmarks of a Bill Belichick team is excelling at situational football. Taking dumb penalties when your defense stops an opponent on a 3rd and 20 that results in a touchdown is inexcusable. Taking not one but two roughing the passer calls in the final minute of the first half and allowing Tampa to attempt a field goal was also unconscionable. Had the Bucs made the field goal there and scored on their first possession of the second half, this game may have had an entirely different outcome. It didn’t but these are the kind of dumb mistakes that we’re used to seeing opponents make against New England. To put it another way, these are the dumb mistakes that losing teams make. And it needs to get nipped in the bud. Yardage Total Shouldn’t be the Driving Factor Tomorrow: As I sit here minutes after the game, I think that while the Patriots defense wasn’t perfect, it was much better. But I have a feeling that the narrative will be driven by Winston’s yardage total rather than the end result. And that is wrong. Once again there was a mistake made, a correctable one where Duron Harmon took a poor angle on DeSean Jackson’s quick slant and it resulted in his busting a 42-yard play. And part of the issue in the 4th quarter was the coach’s decision to lay back farther and trade space for time. Up until that point, the secondary had been very, very good for the majority of the game. Granted, they almost got burned by that strategy late but the yardage shouldn’t drive the train on Friday. Mike Evans was a non-factor and Stephon Gilmore deserves a lot of credit for playing a very solid game. Likewise, Malcolm Butler on Jackson also did a solid job in coverage. Pat Chung had his best game of the season. Moving Hightower back to the middle (another one of our keys) worked much better. Doug Martin had 74 yards rushing but 48 of them were on the one scoring drive in the first half. After that, the run defense tightened up. Wide Receivers Have Big Games: Despite Tom Brady being under pressure all game long, the Patriots wide receivers had a very solid game. Chris Hogan had 8 catches for 74 yards and a touchdown and was wide open in the second half running down the sideline for what would have been an easy touchdown. But the pressure got to Brady and the pass sailed high into the sidelines. He’s become a scoring machine this season, notching his fifth touchdown of the season. 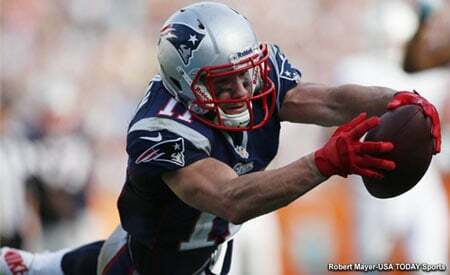 Danny Amendola made several tough catches in traffic in the highly contested areas and also had 8 catches for 77 yards. His best catch (one of three) was wiped out by a penalty. He made a leaping one-handed grab down the sideline He also busted a big punt return (yes we called that in our keys too) to set the Patriots up with excellent field position. Brandin Cooks chipped in with five catches for a team-high 85 yards and James White, operating out of the backfield kept the chains moving with 7 catches for 53 yards. Thursday Night Football Stinks: I’ve never been a fan of this (can you say player safety Roger?) as it consistently fields an inferior product. Tonight’s game was no exception. Teams are beat up from Sunday and play sloppy. We’re on to the Jets. 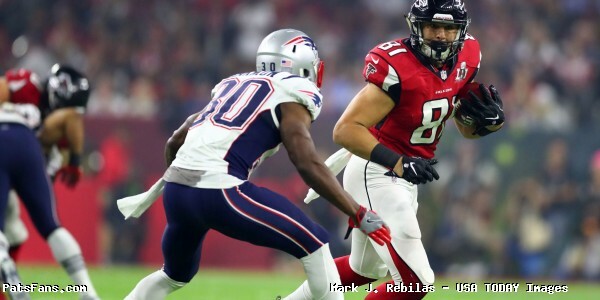 This entry was posted in 2017 Patriots Season, NFL Commentary, Patriots Commentary, Patriots News and tagged 2017 Patriots Season, Bill Belichick, Danny Amendola, Dion Lewis, Dont'a Hightower, James White, Malcolm Butler, New England Patriots, Patriots, Rob Gronkowski, Stephon Gilmore, Tampa Bay Bucs, Tom Brady on October 6, 2017 by Steve Balestrieri. Patriots – Buccaneers Key Matchups, Who Has the Razor’s Edge? The New England Patriots head back out on the road to meet the Tampa Bay Buccaneers in a short week after Sunday’s games. This week’s game will be broadcast by CBS on Thursday, October 5 at 8:25 p.m. ET and can be seen on WBZ-TV Channel 4. Jim Nantz will handle play-by-play duties with Tony Romo as the color analyst. Tracy Wolfson and Jay Feely will work from the sidelines... The game will also be aired on the Patriots flagship radio station 98.5 The Sports Hub with Bob Socci and Scott Zolak on the call, produced by Marc Capello. The Patriots (2-2) came back from a late 4th quarter two-touchdown deficit to tie the score at 30 behind a tremendous performance by Tom Brady, only to have the Panthers drive down the field and win the game on a last second 48-yard field goal. The Buccaneers (2-1) beat the New York Giants 25-23 as Jameis Winston threw for 332 yards including a 58-yard touchdown to tight end O.J. Howard. The team also gets back Doug Martin from suspension this week. The Patriots and Buccaneers are meeting for the ninth time. The Patriots hold a 6-2 overall advantage and a 3-1 edge in games played at each home stadium. Although the 2009 Bucs “home” game was played in London. The teams haven’t met since 2013 when the Patriots beat Tampa Bay 23-3 in Foxboro. 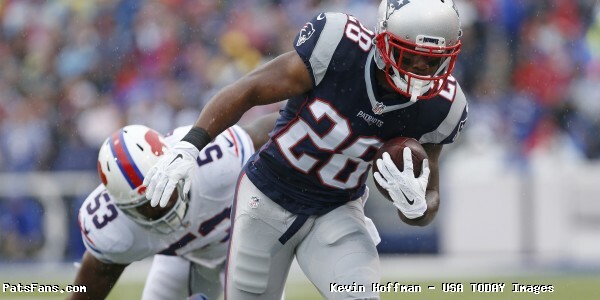 The Patriots running game is still mired in neutral averaging just 95.5 yards per game. The offensive line hasn’t been opening enough holes for the running backs to get anything going. Mike Gillislee had a pretty decent game last week but due to New England being down by two scores, they didn’t run the ball as much. It seems like the team is limiting the carries of Dion Lewis as they really need him to be the kickoff return man. But maybe on a short week he could see some extra work. Rex Burkhead’s status is probably doubtful to play in this week, they could use him in this one. The Bucs are doing an excellent job against the run, allowing only 72.5 yards per game. They have a stout front seven anchored by Gerald McCoy, Robert Ayers, and rookie linebacker Kendall Beckwith. However with LB Kwon Alexander out and LB Lavonte David, and safeties T.J. Ward and Keith Tandy questionable with injuries that could change things a bit. This would be an excellent time for the Patriots to get the ground game untracked. Giving Tom Brady and the passing game more than just a semblance of a running game would make the passing attack that much more effective. But this looks to be another week where they’ll have to pass the ball to run effectively. The Patriots passing game, despite Tom Brady being sacked and hit far too much, is off to a tremendous start of the season. Brady is spreading the ball around to a plethora of receivers including Brandin Cooks, Chris Hogan, Danny Amendola, and Phillip Dorsett on the outside, Rob Gronkowski at tight end and James White and Dion Lewis out of the backfield. Brady is completing 66.5 percent of his passes for 1399 yards with ten touchdowns and zero interceptions. The Bucs, like New England, are allowing a lot of yardage passing. Noah Spence with their pass rush has just a single sack thus far on the season. They have a pair of good corners in Brent Grimes and Vernon Hargreaves who will try to take away the short, intermediate throws and force Brady into going deep. McCoy will be the guy to watch inside, creates outstanding pressure up the middle and that more than anything can get Brady off of his spot and prevent him from stepping into his throws. Depending on the health of Rob Gronkowski, this looks to be a big week for him. I look for Brady to try to establish mismatches with Gronk both down the seams and split outside if the Bucs are in single coverage. Look for the backs, James White and Dion Lewis to be involved in the passing game a lot this week. Tampa’s running game has really missed Doug Martin as they’ve rushed for just 71.5 yards per game. The main man has been Jacquizz Rodgers but he’s more of a third-down back. It isn’t known how much if at all Martin will play. The Patriots will assume he’s going to play and prepare according. They’ll mix their formations a lot but I think we’ll see quite a bit of “12” personnel, with 2 WRs, 2TEs, and an RB. The Patriots run defense has been poor allowing nearly 133 yards per game. They really need to move Dont’a Hightower back inside at the middle/inside linebacker role. It will accomplish two things. It will solidify the run defense and get the communication right down low. Alan Branch has been MIA for several weeks. In trying to stop the run and make the Bucs one-dimensional, he could be a bigger factor this week. Winston has made tremendous strides this season, going from a middle of the pack QB in terms of numbers to a top 10 starter this season. He’s completing 63 percent of his passes with six touchdowns and three picks with a passer rating of 94.8. He’s averaging 277 passing yards per game this season. The addition of DeSean Jackson, though he hasn’t really clicked…yet, has allowed the big Mike Evans to get off to a great start. Evans, 6’5, is open even when he is blanket covered as Winston can just throw it up there for him. Eric Rowe is out for this one, (not surprising) after retweaking his groin injury on Sunday. Tampa has two good tight ends in Cameron Brate and O.J. Howard. Brate is more of a receiving threat and has been productive with 10 TDs since last season. Howard had a 58-yard touchdown reception against the Giants. Rodgers is a good third down back out of the backfield. The Patriots pass defense has been nightmarishly bad this season. The communication has been terrible, the blown coverages and terrible mental mistakes have been inexcusable. What was supposed to be the strength of the defense is approaching historically bad numbers. The pass rush has been inconsistent, however, it isn’t the reason for this unit to play this poorly. Winston has shown the ability to escape the rush and will be looking to make the big plays (see Jackson) that have plagued the team all year. The two tight ends will be a load to cover. Look for Matt Patricia to simplify things, even more, this week. If I am Tampa, I’d run bunch formations all night long until they show the ability to not allow anyone to run free. The Patriots’ Stephen Gostkowski had a big day kicking three field goals including a career long 58-yarder on Sunday. His pooch kickoffs have given the coverage units time to get down the field and stop opponents from reaching the 25 and many times the 20 yard line. Ryan Allen hasn’t been his usual self yet this season although he’s been good at directional punting. The coverage units have been very solid. Tampa has a solid kicker in Nick Folk and in punter Bryan Anger. They too have had good solid coverage. They have the diminutive but explosive return man in Bernard Reedy. But this is the week I believe that the Patriots are going to get a big return from either Dion Lewis or Danny Amendola. This one has the makings to be a shootout. Neither pass defense has been standout yet this season and with two good QBs and talented wide receiver cores, the score could go into the high thirties. Since Sunday I’ve had this one chalked up as a loss. Losing on the last play of the game after playing poorly…at home no less. The signs are there for the Patriots to fall below .500. This was one of the games I had circled for a possible loss when the schedule came out. However, we’ve seen this before. Whenever the chips get low and things are looking down, is when Tom Brady elevates his game the most. The Patriots offense is capable of exploding as much as anyone. And we’ve really yet to see that yet for a 60-minute game. A shootout may actually benefit New England. Winston is still a young QB and is still prone to the occasional interception. When he’s forced to throw a lot is when his pick ratio increases. But the secondary isn’t going to be able to let receivers run free. The Patriots will have to weather the storm. Tampa is a quick starting team. If they can hang with them through the first quarter, things should go their way as the Bucs have been outscored in every quarter but the first. This entry was posted in 2017 Patriots Season, NFL Commentary, Patriots Commentary and tagged 2017 Patriots Season, Bill Belichick, Cameron Brate, Chris Hogan, Danny Amendola, DeSean Jackson, Dion Lewis, Dont'a Hightower, Jameis Winston, James White, Malcolm Butler, Mike Evans, New England Patriots, NFL, O.J. 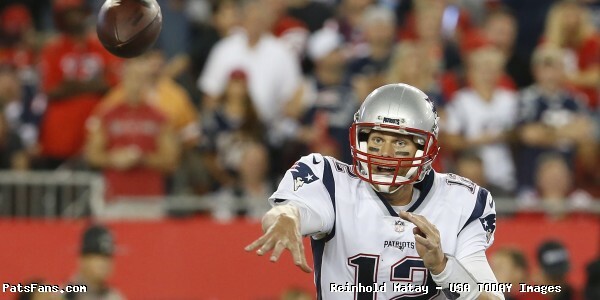 Howard, Patriots, Patriots edge rushers, Rob Gronkowski, Tampa Bay Bucs, Tom Brady, Trey Flowers on October 5, 2017 by Steve Balestrieri.